"A wonderful dish that is a favorite for Derby Day (or any day) brunch." Beat milk, egg, garlic powder, and hot pepper sauce in a bowl. Bring water and salt to a boil in a saucepan; cook and stir grits in boiling water until thickened, 3 to 5 minutes. Remove from heat; add butter and about 1/2 of the Cheddar cheese. 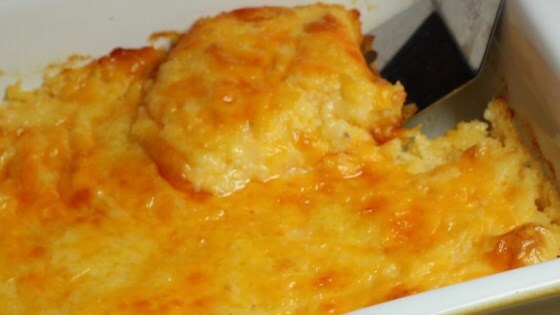 Stir egg mixture into grits and pour grits into the prepared baking dish. Sprinkle remaining Cheddar cheese over grits. Bake in the preheated oven until cheese is melted and grits are set, about 1 hour. Allow grits to cool 20 to 30 minutes before serving. Grits should be cornbread-like. I made this a couple of days before a Kentucky Derby party. I refrigerated it unbaked until the day of the party, then baked it to serve. It worked out great. So very delicious!!! Is a keeper for my family! I absolutely loved this! The flavor is amazing, and I'll definitely make it again! My only problem is that I live at high altitude, so I need to figure out what to do to make it set correctly. I have made this recipe many times and it is always good. I had them on the menu for New Years Day dinner along with blackeyed peas and ham, biscuits and greens. Yum!